Eleven-year-old Winifred Purinton and her sister Mary, 15, stood outside the Cathedral of St. Paul for several hours in a chilly drizzle on the morning of Oct. 7, 1962. They were joined by about 2,000 others who lined Dayton Avenue to catch a glimpse of the first, and thus far only, Catholic U.S. president, who was coming to worship at the 11 a.m. Mass that Sunday. 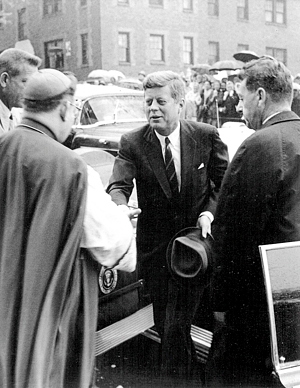 President John F. Kennedy was in the Twin Cities as part of a weekend political tour of the Midwest. The visit, his first to Minnesota as president, came a little more than a week before the start of the Cuban missile crisis and a year before he was assassinated in Dallas. The nation will mark the 50th anniversary of Kennedy’s death on Nov. 22. Accounts of his visit to the Cathedral in both the Tribune and the Catholic Bulletin — the predecessor of The Catholic Spirit — indicate the extent to which some Minnesotans went to see him. Inside the church, an estimated 3,000 people crowded into the pews and aisles, many of them sitting through Masses at 8, 9 and 10 a.m. waiting for him. Kennedy was greeted at the door and escorted to his pew by Bishop Gerald O’Keefe, auxiliary bishop of St. Paul and Minneapolis. Archbishop Leo Binz had already left for the opening session of the Second Vatican Council slated to begin on Oct. 11. Among those seated with the president were Sen. Eugene McCarthy and his wife Abigail; Fred Gates, an aide to Sen. Hubert Humphrey; Cortland J. Silver, a St. Paul businessman; and two secretaries. Two Secret Service agents stood by Kennedy’s pew and several more sat nearby. In her memoir “Private Faces, Public Places” published in 1972, Abigail McCarthy recalled that Kennedy wasn’t well-versed in the rubrics of the Mass. While in the Cathedral, Kennedy was never far from contact with officials in Washington. A special White House phone was installed just inside a nearby side door. Several times during the Mass, “children stood on tiptoes or sneaked down an aisle, trying to catch a glimpse of Mr. Kennedy,” the Tribune noted. During his homily, Bishop O’Keefe assured the president of the parish’s prayers and talked about the council, saying the Church must renew itself to be better equipped to fight the crisis of secularism. At 12:39, Kennedy’s plane took off from the Minneapolis-St. Paul airport for the flight home to Washington. A plaque now marks the pew where Kennedy sat.